Nov. 21–30 (10 a.m.–6 p.m.) Annual Holiday Open House & Wine Sale. New releases, up to 30 percent off all wine and up to 50 percent off case specials, great gift items for everyone on your list. Fee: $5 (refundable with purchase). Nov. 28–30 (11 a.m.–5 p.m.) Join us for a special tasting and experience award-winning wines in the Columbia Gorge. 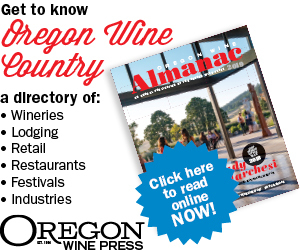 Voted 2007 Winery of the Year and Top 10 Picnic Spots by Wine Press Northwest. Nov. 28–29 (11 a.m.–5 p.m.) Join us for a Thanksgiving Weekend celebration. Nov. 28–30 (11 a.m.–5 p.m.) Join us Thanksgiving Weekend for a special tasting. Great wines begin in the vineyard. Nov. 28–30 (11 a.m.–5 p.m.) Join us Thanksgiving Weekend for a special tasting. Get your fill at Springhouse. Open daily. Nov. 28 (noon–10 p.m.); Nov. 29–30 (noon–7 p.m.) Come celebrate the bounty of Thanksgiving. Enjoy tasting through a flight of our limited-production, boutique wines, including our century-old Old Vine Zinfandel and a special new release for Thanksgiving Weekend. Do some holiday shopping with a 20 percent discount on six or more bottle purchases this weekend only. Experience The Pines at our tasting room in downtown Hood River. Fee: $10 (waived with bottle purchase). Nov. 28–30 (11 a.m.–5 p.m.) Join us Thanksgiving Weekend for a special tasting. Taste the wines of a Gorge original. Nov. 28–29 (11 a.m.–5 p.m.) Join us Thanksgiving Weekend for a special tasting in our welcoming tasting and on the scenic patio. Nov. 28–30 (11 a.m.–6 p.m.) Join us this Thanksgiving Weekend for the new release of our 2012 Malbec: Hogback Ridge and 2012 OLD HWY. This must be the place. Fee: $10. Nov. 28–30 (11 a.m.–5 p.m.) Thanksgiving Warehouse Sale. All of our wines in stock are on sale 20 to 60 percent off. Great case and quantity discounts. Fee: $10 (100 percent of your tasting fee is donated to Helping Hands Against Violence). Nov. 29–30 (11 a.m.–6 p.m.) Wishing you and your family a fantastic Thanksgiving holiday. Join us for the release of our 2010 Blanc de Noir sparkling. You won’t want to miss it! Cheers! Nov. 28–30 (noon–5 p.m.) Join us this holiday weekend for wines and super specials. We will have new release wines, cellar wines and Thanksgiving specials. Fee: $5 (waived with purchase). Nov. 26; Nov. 28 (10 a.m.–6 p.m.) Join us on the other side of the Big River for a Thanksgiving Weekend annual case sale. Enjoy 30 percent off select cases; 50 percent off select cases for wine club. Fee: none.